Today we'll be talking to Lori Stevens. 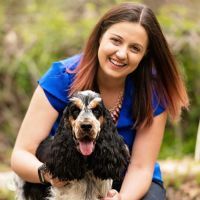 Lori is an animal behavior consultant, a professional dog trainer, a canine fitness trainer, an animal massage practitioner, and a senior Tellington TTouch® Training practitioner. She continually studies how animal behavior, movement, learning, fitness, and health interact. She uses intimidation-free, scientific, and innovative methods, in an educational environment, to improve the health, behavior, performance, and fitness of animals. Lori gives workshops worldwide and has a private practice in Seattle, Washington. She is also the creator of the Balance Harness. Lori's three most recent DVDs by Tawzer Dog Videos are co-presented with Kathy Sdao and called 'The Gift of a Gray Muzzle: Active Care for Senior Dogs.' It focuses on improving the life of senior dogs. She teaches several classes here at FDSA, and today we'll be chatting about her class on massage, available in the April session! Hi Lori, welcome back to the podcast! Lori Stevens: Hi Melissa. How are you today? Melissa Breau: I'm doing pretty well. I'm excited to chat. Melissa Breau: To start us out, do you want to just remind listeners who the animals are that you share your life with? Lori Stevens: Absolutely. Always given a chance to talk about Cassie, I will. Cassie is the one animal I share my life with that lives in the house now. Of course I share my life with a lot of other animals that come to see me in my private practice or, say, this weekend I spoke at ClickerExpo, so I got to meet a lot of wonderful dogs. So I consider all the dogs that I share my life with. But Cassie is almost 14, she'll be 14 in July, and she's doing wonderfully. I got to show her off this weekend, and she's it. I've had her since she was about 2, and she's an Australian Shepherd with the tail of a Red Merle. Melissa Breau: Awesome. Did she go with you, or you were just showing off pictures this weekend? Lori Stevens: A lot of video. Maybe a photo or two, but a lot of video in my talks. Lori Stevens: Yeah, it was pretty fun. Melissa Breau: I wanted to talk about massage today, because you have a class coming up. To get us started, can you share what the benefits are of massage when we're talking about performance dogs? Lori Stevens: The benefits are … a lot. There are a lot of them, so I can just make this list and it will sound a little bit boring. But I want to say things like, it loosens tight muscles and fascia — I'll explain what fascia is and it's effect on the musculoskeletal system in that course. It certainly reduces the risk of injury, or can reduce the risk of injury, rather. It helps recovery from injuries or surgery, it helps relax the nervous system or it can stimulate the nervous system, speeds recovery after sports and exercise, it reduces muscle spasms, and it increases flexibility and joint movement. But another side of it is that it also has an effect on behavior. It really is a trust builder, and that can translate into a lot of other areas around handling. I can talk a little bit more about that later, but that's a really nice side benefit of it. It gives you some methods to help your dog relax more quickly. Once you've built up the trust, and once you've built up the touch relationship with your dog, then you can influence relaxation when you'd like to. It enhances proprioception, it enhances the dog understanding where their body begins and ends, and how it is aware of everything around it during movement. It does a lot. Helps rid the body of toxins, helps aging dogs for sure — all dogs, though, really — and sports dogs for sure. Melissa Breau: You mentioned that it helps the trust. I could really see, from a relationship standpoint, how that could be beneficial. So often when we're interacting with our performance dogs, its work, work, work, work, work, and it's a less-working part of relationship-building. Lori Stevens: Yeah. I could go on and say a little bit about that, and that's that every time you touch your dog or handle your dog, you're really doing husbandry under a general umbrella of husbandry. The more touch you have, and the more ways of handling your dog, there's more options in terms of what you can do with your dog in a way that your dog doesn't get uptight at all. There's something that I've been thinking a lot about, because I've got a webinar coming up on pre-senior dogs, and one of the things I think is important are tactile cues. As you know, whenever we add a cue, we do new cue, old cue, and then the behavior happens. Once our dogs lose their senses, once they can no longer hear and see as well, then you can't use that old cue to help you build your new cues. Another side of it is tactile cuing, and of course if you have done a lot of bodywork, and you've done handling, then tactile cues are much easier for you to teach your dog than if you haven't. So, to me, this course is for everyone because it spills over into so many different areas. Melissa Breau: That's a really interesting point. I wouldn't have thought about that, but I can certainly see how useful it would be, as a dog is aging, to be able to already have that language. Lori Stevens: Yes, absolutely. Really important. Melissa Breau: Is massage something that anyone can do? Are there limitations to what somebody like me, who maybe knows nothing about it, can do? Lori Stevens: Yes, there are limitations, and yes, it's something anyone can do. I don't want to take away from a really experienced sports massage therapist that have very practiced hands. Those of us who are certified have been doing bodywork for a really long time. We can feel things happening in muscle, and we can identify quickly what technique to use to change that tissue and help encourage it to be healthy again. Not necessarily make it healthy, but encourage it to be as healthy as it can be again. That's the professional side of it. But as not a certified massage therapist, as just a person who works with their dog, what you can do is you can really get to know the geography of your dog. You can really get to know what their muscles feel like, what their fascia feels like when they're not injured, and you can also — hopefully from taking my class — you can learn how to feel when tissue may not feel as normal as it did before, and that gives you a clue that maybe you should have something checked out. I think that there's a lot you can do to keep the tissue elastic and get a really good sense of how your dog feels when you touch your dog. You can learn a lot with your own hands on your dog. Then there's also the professional side of it, which is just a little bit more technical. Melissa Breau: You're talking about feeling all these different parts of your dog. How important is it for students to understand what it is they're feeling, that underlying anatomy? Lori Stevens: I use illustrations in the course that people can always go back to and see the general muscle fiber direction for various muscles and various areas of the body. I don't say, "Now we're going to massage the biceps brachii," for example, or "Now we're going to massage one head of the triceps," or something like that. I don't do that. I don't think it's important for those of us that are just learning massage to have to know where every single muscle is, though each week I will give a list of which muscles we'll be affecting and what their function is. So people will see that, but they don't have to know it in order to put their hands on their dog and for their dog to get a lot of benefit from the massage techniques we'll learn every week. There are anatomy illustrations, there is information on muscles and what their functions are, but you don't have to really know that. You can just have a general feel of it in order to massage your own dog. It's there if you want it, but you don't have to have it. And we won't be focusing on individual muscles. We'll be working on muscle groups. Melissa Breau: Can you share a little about how some of those different systems are involved when it comes to massage? I know you talk about the nervous system and musculoskeletal system — and holy cow, I totally stumbled over that word, but that's OK.
Lori Stevens: You did great just then! Melissa Breau: I could not say it to save my life last night, let me tell you! Lori Stevens: Well, sometimes the end of the day it's different. I do talk about the nervous system and the musculoskeletal system and how we can affect it. I'll give you a couple of really quick examples. If you reach down and pat your dog really hard and fast, you might be affecting the nervous system, and how you might be affecting it is you might be speeding it up. So you're doing the opposite of calming your dog down. You might also cause some muscles to hold or tense up with that hard patting. So you might be affecting various systems, not just one system. Everything works together in these super-complex systems of ours. What an amazing thing these entire systems are. But what's also cool is that you can actually reach down to your dog and do a really slow stroking touch — not for every dog, and not in every situation, but there are ways we can touch our dogs to actually calm the nervous system and therefore calm our dog, which is super-cool. I even have a section in the course on the tail. Believe it or not, when Cassie was younger, she would get quite excited when she saw another dog, and some would have called her very reactive. She could bark, lunge, and all that. One of the first signs that she was getting ready to do something like that was her tail would go up in the air. Her long, beautiful Aussie tail would go up in the air. That was one of the signs I looked for because she has a tail. If I stroked her tail a certain way, starting quickly and then slowed down, that tail would relax and so would her nervous system and so would she, oddly enough. So you can have an impact on how up your dog is. You might want them really up before you run in agility, and you might want them to come down a notch when they get out of the ring, so you can do those slower strokes. You're affecting everything every time you touch your dog, but you can actually see the changes based on the speed of your touch, the way you touch, and the same goes for working with the fascia and the musculoskeletal system. You can relax the muscles and help them warm up and get more elastic when you're touching them with the warmth of your hand versus not doing anything, for example. Melissa Breau: You've mentioned fascia a couple of times. Do you mind giving us a quick explanation of what that is? Lori Stevens: Not at all. Think of your muscles. There's this network of … think of it as kind of a net, and there's this net under the skin that within this net or network of tissue are all the muscles. If your fascia is super-tight, your muscles are going to have trouble elongating and being elastic. Actually, fascia is my favorite thing to work on, because we can relax and manipulate the fascia at a lighter level. Not a tickly level, but at a lighter level than feeling like we have to go down deep into muscle. When we do relax that fascia, we are relaxing muscle. It's pretty amazing. I talk about it in a little more detail in the course, but fascia's it, man! I love working with fascia, so I encourage everyone to learn a little bit about fascia and how they can affect it. It's a neural network of protection for the muscles, and it can get tight and respond to things just like muscles can. Melissa Breau: Interesting. I know you mentioned that you focus on muscle groups. Are there specific muscle groups that matter more to some sports than others? Different techniques that matter more or less for a given sport? Lori Stevens: For agility, for example, massage everything. Lori Stevens: Yeah, whole body. I think every sport, everything. But, like, nosework, the dogs are out front, they're forward on their bodies more than they're moving from the back end or twisting and turning quite as much. They move in all directions, but their nose is forward to the ground or forward and up, so maybe the front end gets a little bit more work than it normally would. Obedience is probably most parts of the dog. Certainly a bunch of herding work and sports work … fieldwork, I mean — that is all the whole body. So I think it's good to learn the whole body. And then maybe just knowing your sport and which areas of the body get the most work, then you can focus on that area a little bit more. Now, to what techniques to use for each sport, I say use the ones that work best for you and that your dog responds the best to. I've taught this class once, I think, before, but I've taught bodywork quite a bit. Every time I teach bodywork, people are like, "My dog likes this technique the best." People figure out what they're able to do the best, and what their dog responds to the best, and those usually go together, and I say, "Use those." Develop the other things more slowly. But some of the techniques just don't resonate with people, and that includes me. I don't use every single technique every time I work on a dog. There's certain things I go back to because they feel the best for me to do, and I get a lot of response from dogs when I do them. Melissa Breau: Some dogs are more willing to lay still and be manipulated or be physically handled than others. In my household I have two dogs that would love to crawl inside my skin with me, they can't get enough touch, and one dog that's like, "If you touch me twice, that's enough." Are there things students can do to help set themselves and their dogs up for success with massage work? Or are some dogs just not going to be into it? Lori Stevens: I've worked with dogs that it took me two or three months before I could really work with them. There are some dogs that are very, very sensitive to touch, and those dogs, what's important is that we take our time with them and we really let them decide if and when we can touch them and for how long we can touch them. This isn't a "You lay down and I manipulate you" type of thing. This is "I'm asking you if I can touch you, and I'll show you ways that I can touch you that are less invasive from your perspective." Not that I can know their perspective, but I can tell that if I use a little bit of the back of my hand versus my whole palm and hand on them, that's less threatening to many, many dogs that are super-sensitive. And then I can go from there to help desensitize the dog to touch. Oftentimes those dogs that are the most sensitive to touch end up being the biggest touch hogs. We don't push it. We take our time, we look for signs that they're uncomfortable, we let them move when they want to move. It's super, super important to understand that this is one of those things where less is really more. It really comes into play. However, the payoff is huge, because then you have a dog that can accept touch, you've just really developed your trust relationship with your dog by giving them the choice to say yes or no and how long, and then we can get much, much further with massage, cooperative care, vet exams, all sorts of handling, and then tactile cues and all of that. I know some people hesitate to take this course because their dogs are so sensitive to touch. I would say, "Take this course." I'll cover a bit about the sensitive dogs, but then you've got the skills you can practice on yourself or on another dog, and you can very slowly work up a dialog with your dog about when and for how long you can touch, and when you can move from the back of your hand to the front of your hand, when you can move from a stroke that's two inches long to a stroke that, if your dog's long enough, twenty inches long. All of that is building slowly and guided by your dog. Melissa Breau: You used a phrase in there that I really love. You said, "You can work up a dialogue." It's almost poetic in just the sense of the whole thing, capturing what you're trying to do. Lori Stevens: Right. Gosh, I can't stress that enough. That goes for so many things. It's not just touch. When you think about the people that are sensitive to touch, for whatever reason they may have, I've had people in my bodywork classes where I'm showing things on people, and I tell them, "If you're somebody who's sensitive about touching and don't want to be touched, please feel free to not participate with another person. You can just do this on your own leg or your own arm." There are definitely, you know, take it slow. Only do what you're comfortable with. And that goes for our dogs as well. Not all dogs have been handled in the best way, or they were just born with super-super-sensitive skin or nervous systems, and we have to take it slow and build that very carefully. Melissa Breau: One of the bullets on your syllabus mentions specifically observing posture before and after massage, and that piqued my curiosity a little bit. Can you share a little bit on what you mean by that? Lori Stevens: Yeah, of course. I work with a lot of dogs, some of them recovering from injuries. Some of them are older, and they may walk into my practice to get a massage, and they may be moving really stiffly, or they may be uncomfortable standing. What I tend to do is I tend to work on a part of the dog and then have them move, and work on a part of the dog and have them move. I do a lot of back and forth between movement and bodywork, and what I see, or what I hope to see, by the end of the session is that the dog is standing much nicer, they are moving much better, they aren't as stiff, they're more aware of their bodies. By combining slow movement with bodywork, I'm integrating the bodywork, and these two go perfectly together. So I'm integrating the bodywork into movement by going back and forth, and what I see is even the posture and standing changes and dogs move better. That's why I do behavior, fitness, bodywork, and massage — and TTouch, that's included as well — is because they all go so well together. They're all intertwined. There's not a "just behavior" component, or a "just touch" component, or a "just movement" component. It's all part of the dogs. Melissa Breau: For folks who are thinking about the class, do you want to share a little more of what else is included? I know it's a pretty comprehensive syllabus when I was looking it over. Lori Stevens: Yeah. I don't know why I include so much in every class I do, but anyway … . They could all be multiple classes probably. In this class I talk about specific massage techniques. We learn a new technique or two or three every week, and I incorporate some TTouch in there, not just massage, not just what you would learn in a massage school. I cover the touch sensitivities, as I spoke of before, and fascia. We do some passive range of motion, some stretching, we talk about different parts of the body — even the tail or the nub of the tail. I give a list of muscles and their function. So there's a lot in there, but it's broken down by week and general topic. For homework I really like people to pick and choose what they want to work on, so maybe in a particular week they only worked on one technique and that's fine. You can work on another technique later. Every week, just as long as you're turning in video or trying things that I have covered, I don't think people have to learn everything that's presented in one week. You can always go back and add stuff. Melissa Breau: Like you were saying, some things they may experiment with and decide, "That's not a technique that I personally am going to use a lot, so I'm not going to work on it a whole bunch." Melissa Breau: That's really neat because it lets people pick and choose a little bit. If folks are listening and they're interested in signing up, I know we talked a little about touch-sensitive dogs and dogs that are in different places in that spectrum. Who is really a good fit to take the class, and is there anything else they should know going in? Lori Stevens: They should probably know that Golds are sold out. Lori Stevens: Honestly, I would have a difficult time coming up with who should not take this course. I think because of the way bodywork translates or converts or generalizes over into other things we use our hands for, I just think you can't go wrong taking this class. Even if you just use a couple of things out of it, hopefully what you're really getting is that touch dialogue. And also doing some things that help maintain the health of your dog. That's a second one. And a third one is making it easier for you to discover when there might be an issue. I cannot even tell you how many times people have brought their dogs in for me to work on them and I find a lump. They can be fatty tumors, whatever, but I find everything, because I put my hands on their dog and they're like, "What?" I'm like, "What's this?" And they're like, "I had no idea." So knowing the geography of your dog with your hands is so important. It's learning how the tissue feels and how the tissue responds, like, maybe all of a sudden you see the skin tense up in an area where you touch, or your dog flips their head around. You might notice certain areas are cold or hot. All of this is information, and I think there's a wealth of information in touching your dog. I think it's important for us to use that just as much as we use looking at our dogs. I think smell is important too, actually. If all of a sudden our dog smells bad, their breath smells bad or their ears smell bad, that's something to get checked out. I'd say short of tasting your dog, just for some entertainment, using our senses — listening to how they bark or how they breathe — using our senses — and all of them, including touch — with our dog is super-important. Melissa Breau: As a final question here, what's a lesson that you've been reminded of or learned recently when it comes to dog training or the stuff we've been talking about? Lori Stevens: It's funny, because this does go with my webinar I have coming up on the pre-senior stage, because I think that there's a lot more we can do — I'm going to call that dog training — there's a lot more we can do with our dogs as they get a little bit older, before they're considered old or senior or aging really quickly. There's a lot more we can do. One of those is the tactile cues. Another one is fitness, to prepare for being a senior and to go into that strongly. So many dogs come and see me once they've already lost function, and so we work to get the function back. I'd like to see more dogs keep the function throughout their entire aging process. I'm reminded of that a lot. All of that. Melissa Breau: Do you have the date and time of the webinar handy? I don't have it up. Lori Stevens: I think it's April 11 at 6 p.m.
Melissa Breau: Hopefully some folks will join us for that and will check out the massage class. Thank you so much for coming back on the podcast Lori! Lori Stevens: I should say I think it's 6 p.m. Pacific time, but I'm not positive. It is April 11. Melissa Breau: I can be a good host and actually pull it up! Because it's only part of my job to do those things. So it's Thursday, April 11, at 6 p.m. Pacific time, for folks that are interested. Well, thank you again for joining me. Lori Stevens: Thank you very much. I appreciate it. It was fun talking about bodywork. Melissa Breau: Yeah, and thank you to all of our listeners for tuning in!